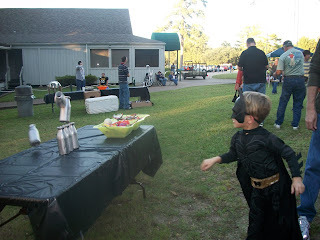 Dawson went as Batman to our church fall festival. 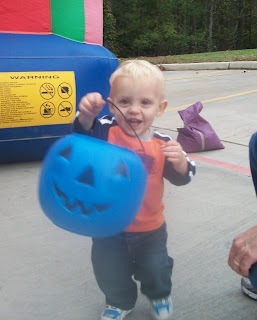 He had a great time playing games, jumping in the inflatable bouncer, climbing the rock wall, eating pizza, and going on the hay ride down to the lake to roast marshmallows. 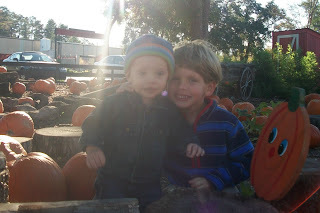 Brady excited to carry around Dawson's basket for a few minutes. 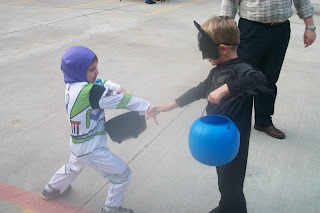 Buzz Lightyear (Seth) and Batman greeting each other. 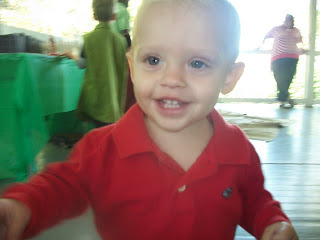 Brady happy and smiling, as usual. 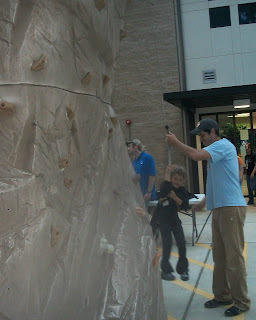 Dawson making his way up the rock wall. He made it about a third of the way up. 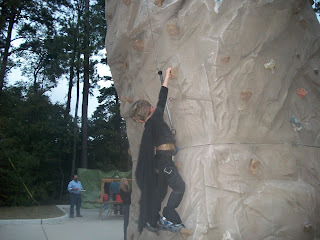 The best part about the rock wall was "flying" down. 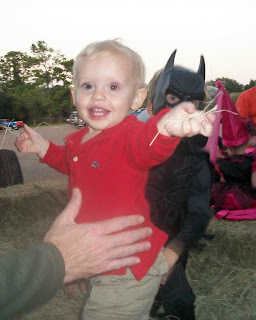 Brady excited about playing with the hay on the hay ride. Showing me his big handful of hay. 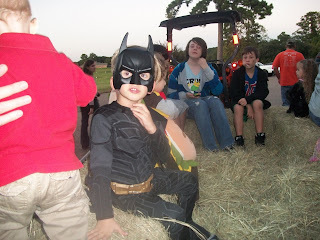 Dawson ready for the hayride. 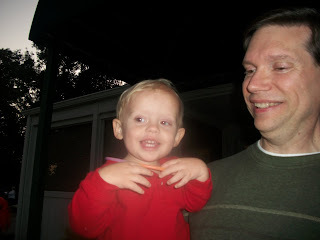 Brady really enjoyed playing with his glow necklace. 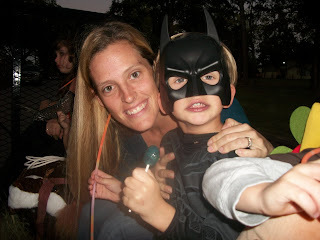 Me with a very handsome Batman. 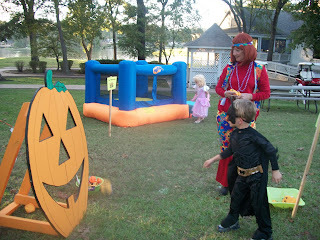 A few pictures from our neighborhood fall festival. 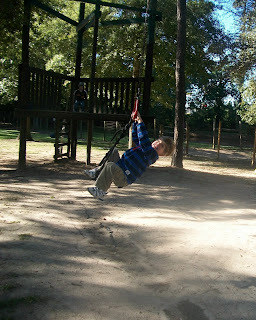 It's small, but still fun! 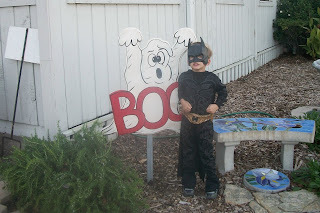 Batman - I mean Dawson - posing by the ghost. 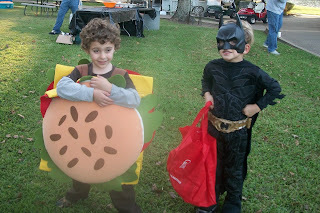 Tanner the hamburger and Batman Dawson. 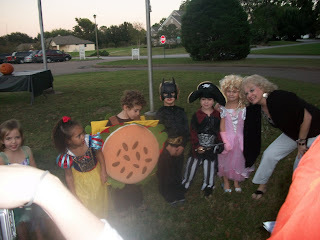 All the kids lined up for the costume contest judging. 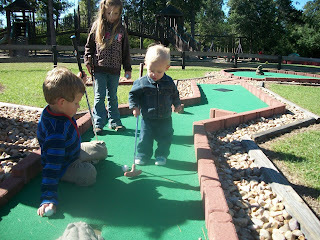 Playing the miniature golf game. 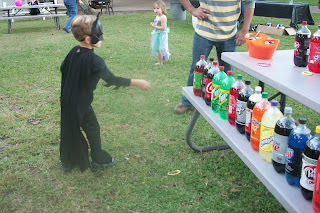 Trying to ring a coke bottle. On Saturday, we attended the 15th anniversary of the big Sam Houston statue (the tallest statue of an American hero). It was a small event and not many attended, which is unfortunate because it was really nice. 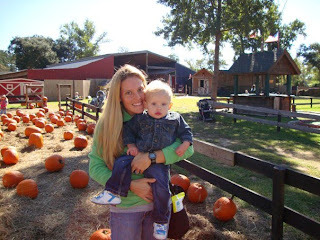 There was free lunch, a birthday cake for Big Sam, games for the kids, miniature Sam Houston statues that they could paint and take home as a souvenir, a band, and speakers. Plus, it's always fun to visit the giant statue. 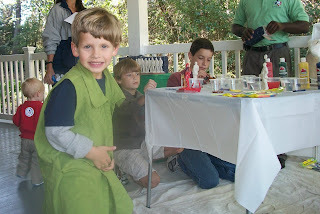 Dawson painting his Sam Houston statue. 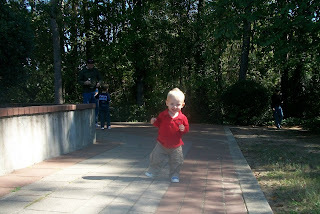 Brady happy walking around the huge wraparound porch at the visitor's center. 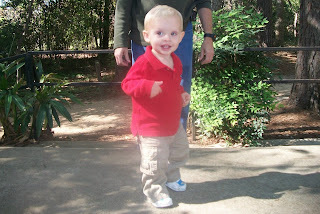 Happy walking around the Sam Houston statue. 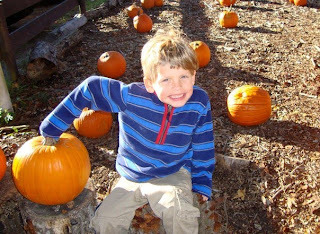 Do you get the picture that he's happy just to be able to walk around? Such little pleasures. Dancing to the music from the band. 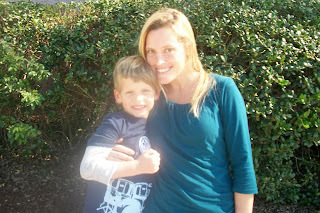 Me with my sweet Dawson! 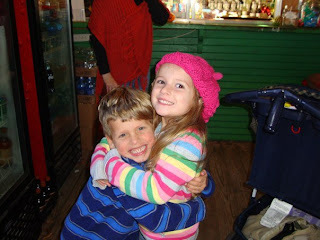 Dawson and Kaelin giving each other a big hug. I love how happy and excited they are. A cute close-up of Brady as he comes to see me. 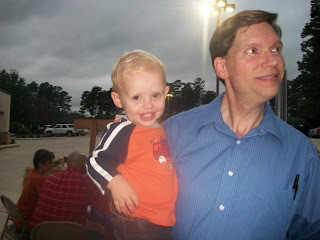 A rare picture of Dawson and Brady together. 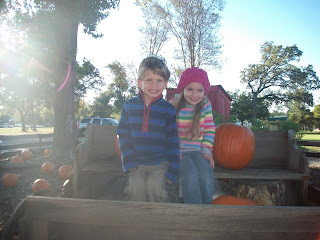 Cute friends Dawson and Kaelin. 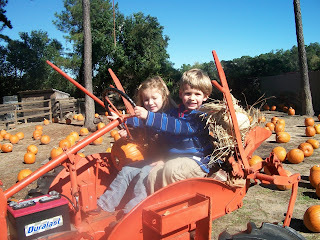 Kaelin and Dawson in the tractor. 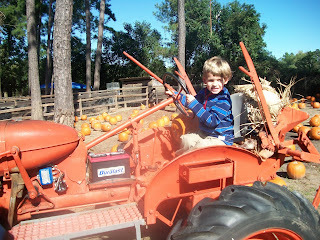 Dawson pretending to drive the tractor. 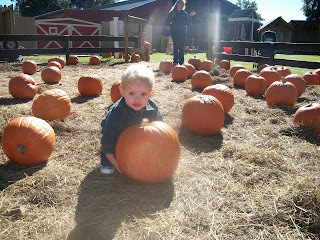 Brady trying to pick up a pumpkin. 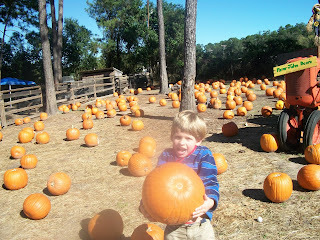 Dawson lifting a heavy pumpkin. 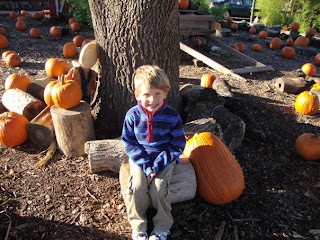 Looking cute sitting in the pumpkin patch. 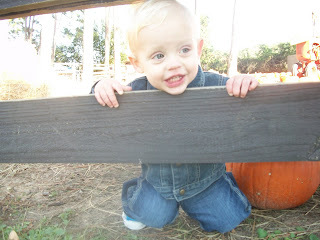 Brady peeking through the fence. 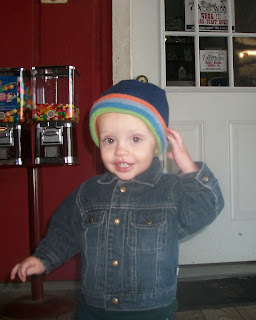 It was chilly when we went to 7 Acre Wood so I put a warm hat on Brady. It was the first time he's worn a hat and he wasn't sure what to think about it. 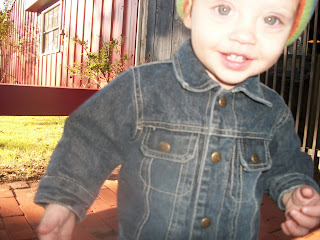 Looking super cute in his hat. 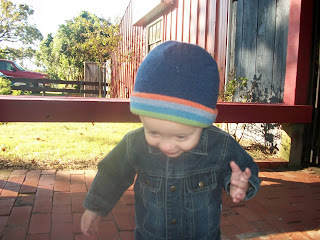 When I told him to show me his hat, he bent his head down to give me a closer look. 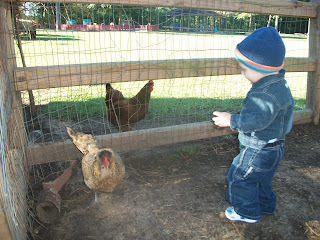 Both boys loved visiting the animals in the petting zoo area. 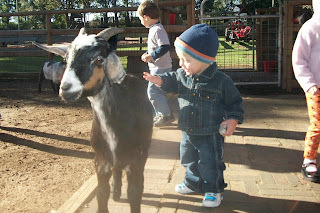 Brady excitedly petting a goat. 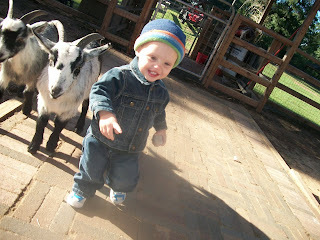 All smiles as he walks around with the goats. 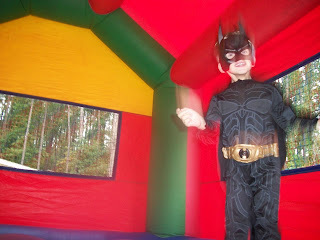 They were just his size! 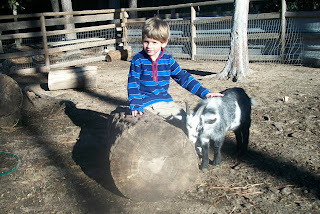 Dawson hanging out with one of the goats. 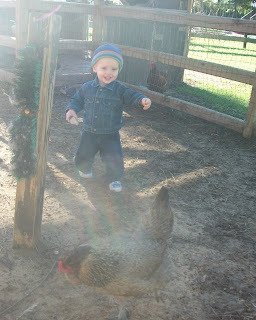 Brady going after one of the hens. 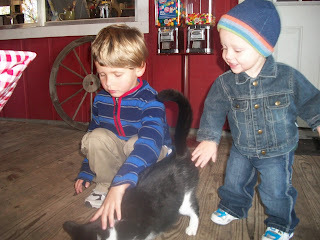 Petting one of the friendly cats. 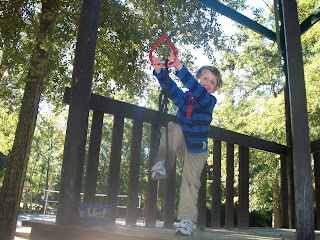 Dawson always has a great time on the zipline. 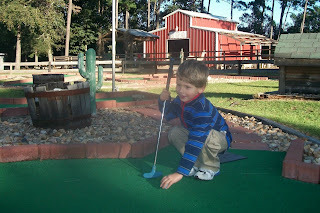 Surprisingly, Dawson's favorite attraction at 7 Acre Wood was miniature golf. 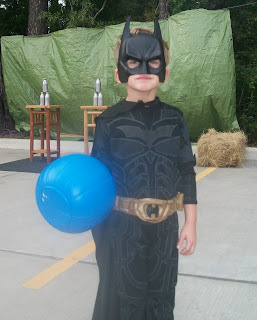 He spent more time putting balls than anything else. 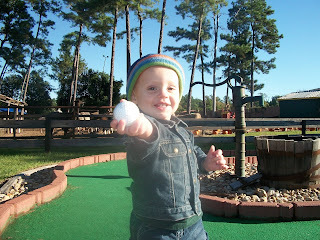 Brady also enjoyed walking around the course and playing with the balls. 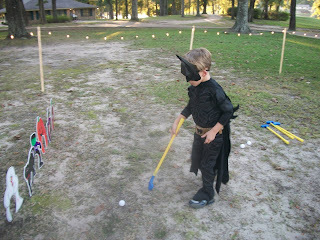 Setting his ball down in preparation to putt. 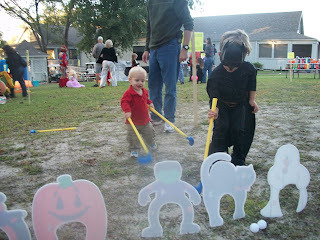 Hitting the ball toward the hole. 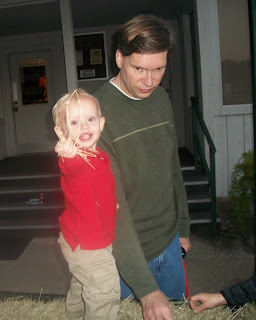 Brady showing me his ball. 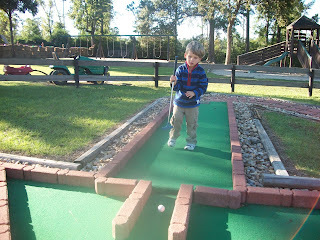 Putting the ball in and then taking it out of the hole. 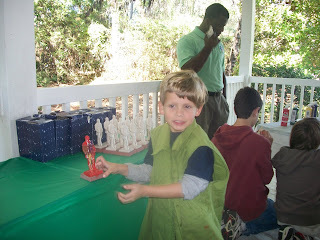 Dawson was so sweet here. 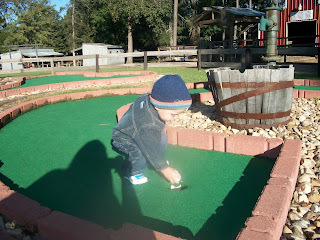 He gave Brady a putter and then put the ball down in front of him and was really encouraging him to hit the ball and cheering for him when he did it. It was a great big brother moment.